Remember the last time when your phone rang, with some pre-recorded robocall messages saying—You owe! You've won! You qualify! And you've REALLY had enough. If you are at the breaking point from these robocalls, you may be looking for a robocall killer. However, RoboCall killer apps should really be avoided as they pose much more dangers and benefits. In this article, we will tell you THREE things: 1. Why you could be receiving robocalls, 2. why robocall killer apps are no good, and 3. how you can effectively stop all robocalls FOR GOOD. Robocalls are automated voice calls with pre-recorded messages or personalized audio to make it sound like a real human. They are usually dialed by a computer program or a robot, making it easy to reach a wide number of people from anywhere in the world. Robocalls are usually used for telemarketing or even scam calls from countries such as China. No matter the usage, the nature of robocalls are the same. They are a hinderance and may result in scams or unexpected purchases if you interact with the phone call. In recent years, Robocalls are getting more creative and can be even more hard to detect or easy to fall into. For example, there are scam calls with automated voice message pretending to be from a courier company informing you of uncollected packages. Another common one is a call from a male voice pretending to be from the local police and accusing you of a petty crime. In both cases, the robocaller will instruct you to transfer money or enter credit card details in order to release the held packages or be free from the petty crime. Not all robocalls are scam calls. A popular "Call from Santa" app can allow parents to input some specific words and have Santa personally dial their kids to send them a Christmas message. In past political campaigns, political candidates have also used government robocalls or political robocalls to gain national attention or to connect with voters. If you are receiving Robocalls, there are several reasons why you were targeted. A good way to find out if your number was scrapped from the Internet, is to simply do a search in Google or other popular search engines like Bing or Yahoo. If you find your number appearing on some website associated with other online data such as a Facebook profile, it means that this data is publicly available and can be easily picked up from crawlers and scrapers. There is also a high possibility that your number appears in a calling list. When you sign up for a membership or use your phone number on a website, you are unknowingly submitting your phone number into a list. Numbers on these number lists are very commonly sold and shared to third-parties without your consent. This is why we highly recommend using a second phone number when giving out your number, but more on that in a bit. You could be very careful with giving out your real number, but still fall victim to robocalls. If you experience something like this it is possible that your number was dialed at random. Sometimes, you may receive calls like that from numbers with the same area code. Spam callers use this trick to fool you and make you more likely to answer. Here's the tricky thing. Once you have picked up such a before, your number gets may get identified as an active number and may be flagged by the robot phone with "First attempt" or "Try again", and will automatically the target of even more robocalls in the future. Reason 4: You fell victim to a random robotext! Reason #4 is similar to reason #3: You could have received a robotext sent out to random numbers with seemingly harmless marketing message, with the spam text message saying you can reply "STOP" or "UNSUBSCRIBE" if you do not wish to receive these messages. If you really do reply, then nice work there, as you have just subscribed yourself to even more robotexts and robocalls! Robocall killers are apps that claim to be able to block telemarketer calls as well as spam calls. There are a number of different robocall blocker apps in the App Store and Google Play Store, providing call blocking services and spam call protection. Robokiller app #1 - How does it work? Robocall killer apps intercept the call and answer it on your behalf. As a result, your phone does not ring nor go to voicemail. However, getting an external service answer and manage your calls isn't the best idea. Read on to understand why. Most call blocker apps require paid subscriptions, and might not work 100% of the time. 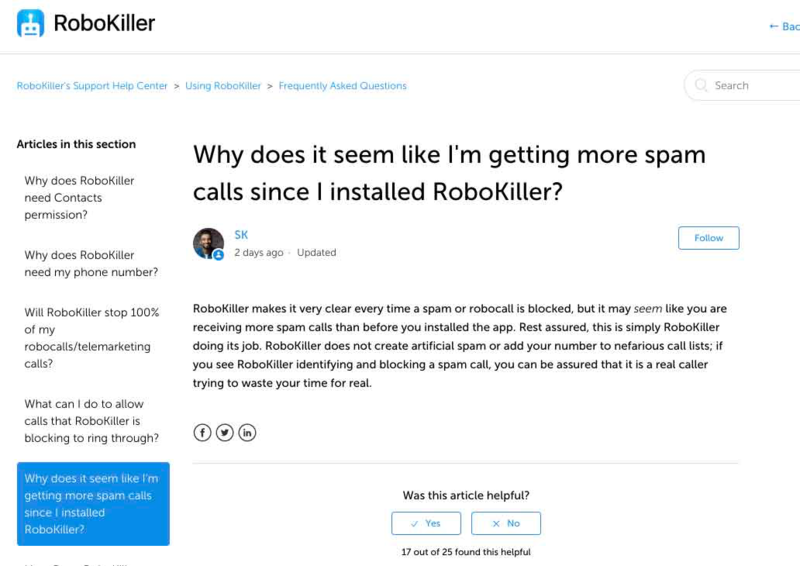 Users of popular Robocall killer apps have reported bad experience with Robocall killer apps blocking all the legitimate calls and letting through all the bad, scam calls. Furthermore, according to the FCC, many call-blocking or robocall killer apps collect your personal information, including private information such as what numbers call you and call history, your phone number, name etc. Imagine this: What if these Robocall killer companies took the collected information, and then sold to other third parties, which in return, put you in bigger risk of more robocalls? We would not be surprised if that happens. That may explain why you may be receiving EVEN MORE robocalls after downloading their app. The robocall killer companies may be creating artificial robocalls, or even putting you in a robocalling list! The calls perhaps came from the same people themselves, and that may be the reason why the robocall killer apps can so effectively them "blocked" these calls. There are a number of things that the FCC recommends that you can do to protect yourself and block telemarketers call on iPhone and Android. Avoid picking calls from unknown numbers. However, this will end up blocking ALL CALLS except for those in your contacts and numbers you have placed in the whitelist you can created. As a result, this may cause you to lose many important calls, making it not a very favorable solution. SO, how can I most effectively stop or prevent robocalls? By now, you would have understood the root of the problem: Your actual, persona, real phone number, was placed in a calling list or discovered to be an active number by robocallers by random calling or scraping the Internet. Once this has happened just once, you will be the victim of endless spamcalls and robocalls. Therefore, the best solution is to never share your real phone number to anyone that you do not know other than your friends and families. For everyone else, you can get a second phone number that people can call and text you at. Second phone numbers also works well to act as business phone numbers, numbers for Craigslist, for using to sign up over an online website, and even for dating and to text strangers that you do not know. 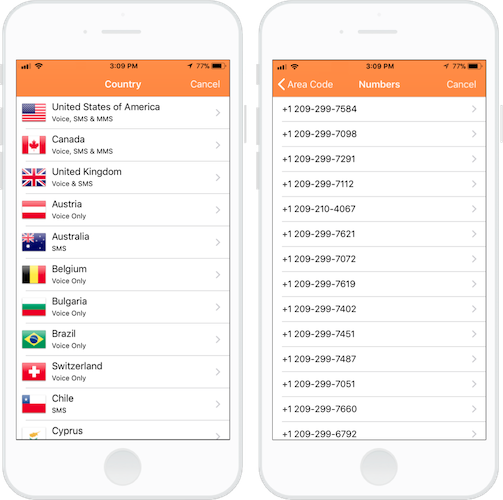 Phoner - 2nd phone number is an app that allows you to buy second phone numbers or temporary numbers (Also available on Android). Even if your second phone number landed in a robocalling list, you can always burn or dispose the number and get a new one. Phoner is not only the top rated second phone number app, we allow you to try out the service to start calling and texting completely free by giving you a free anonymous number. Phoner has been the best solution to block soliciting calls on iPhone and Android, and will also be by far the most effective and best solution for robocall killing. Phoner it protects your actual phone number and ends all robocalls without the risk of ending up in the wrong hands of robocallers.